Identification: The body of this animal is translucent-orange with opaque white on the top of the head and along the dorsal midline. The cerata are translucent-orange and the inner 2 or 3 in each group have opaque opalescent-white pigment on their distal two thirds. There is a small orange patch on the anterior face of each white ceras and the cerata are tipped with teal blue. 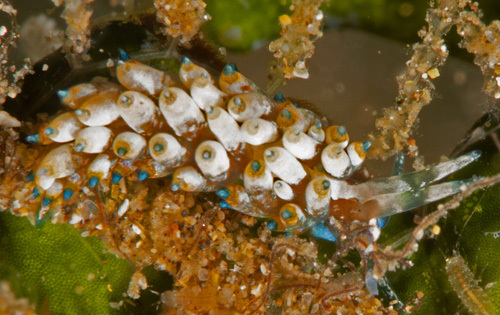 The cephalic tentacles are translucent-blue with white opalescent flecks and bright blue bases. The rhinophores are white at the bases and tipped with blue. In some animals, they have a medial, bluish-black band. Natural history: Eubranchus sp. #6 is a moderately rare species found in moderately protected to highly exposed rocky areas and in Halimeda kanaloana beds at depths of 4.5-32 m (15-105 ft). It's found on the hydroid Sertularia that grows on algae (Gosliner, et. al., 2008). A 4.5 mm animal laid two white, spiral egg masses. The largest was 3 mm in diameter with 1.5 whorls and a ribbon about 0.6 mm wide. They hatched in about 2.5 days in the laboratory. Distribution: Maui, Oahu and French Frigate Shoals: widely distributed in the western & central Pacific; also in the eastern Pacific. Taxonomic notes: It was first recorded in Hawaii off Makena, Maui by PF on Apr. 21, 1991. Photo: CP: 4.5 mm: Kapalua Bay, Maui; July 30, 2002.